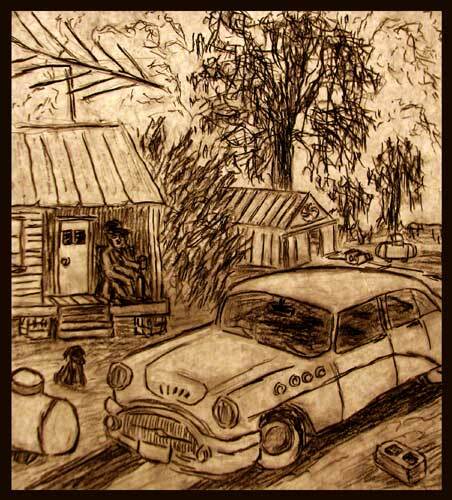 The White Car short story illustration. Charcoal drawing by author. We lived out on the highway going out from Greenville toward the river bridge. All the houses scattered around us were relatives, all members of my father’s extended family: great uncles, uncles, cousins, etc. Our house was between my grandfather’s house and the highway. He lived by himself in an older house that had originally been an overseer’s house. Behind his house was the main welding shed, and a field full of old tractors and broken-down trucks. All this old equipment was rusting and surrounded by Johnson grass as tall as a full grown man. My grandfather kept goats to help keep the weeds down, but mainly they stayed under the pecan trees down in the pasture. Sometimes I would be sent into the field of rusting trucks with a handful of wrenches to retrieve an alternator, radiator, etc.